The last two weeks here have been beautiful and sunny and at times even so warm it feels like summer. This of course has brought on this feeling of being constantly chripy, like the birds outside my window, singing their song this morning: Dawns Chorus. After a somewhat dull last couple of months, it is a relief. I have been out on fantastic hikes and early morning walks, which became a rarity over the long winter months. Morning walks, I have rediscovered, are a luxury that one cannot live without; so long as the weather is good and it is not below freezing. Whether shared with a good friend, or alone they get your day started, get you in touch with the world out there beyond your four walls and get you energized to tackle whatever it is that your day will throw at you. Not to mention, they aren’t such a bad way to tackle that winter flab, but that is just a bonus. A further bonus is the undeniable inspiration they bring on. 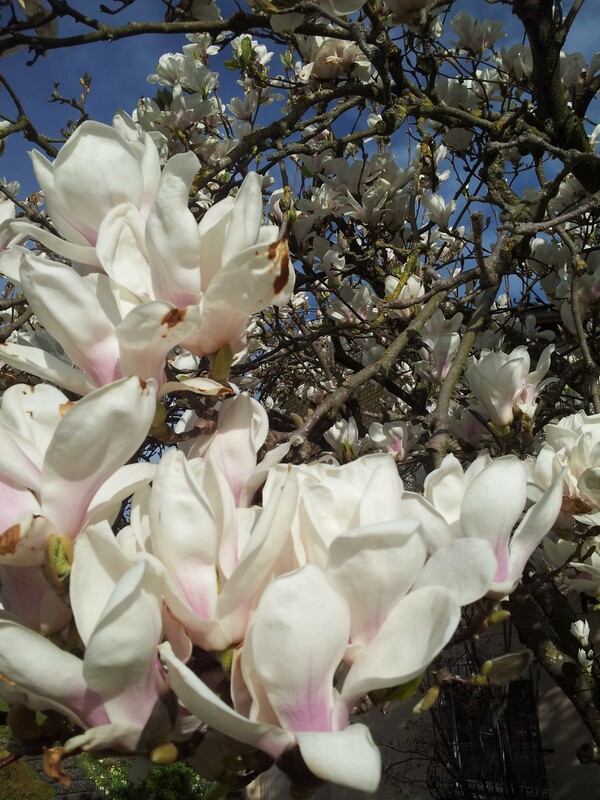 Walking around my village and surroundings, I love peeking in the gardens to see what spring flowers have decided to show their faces. 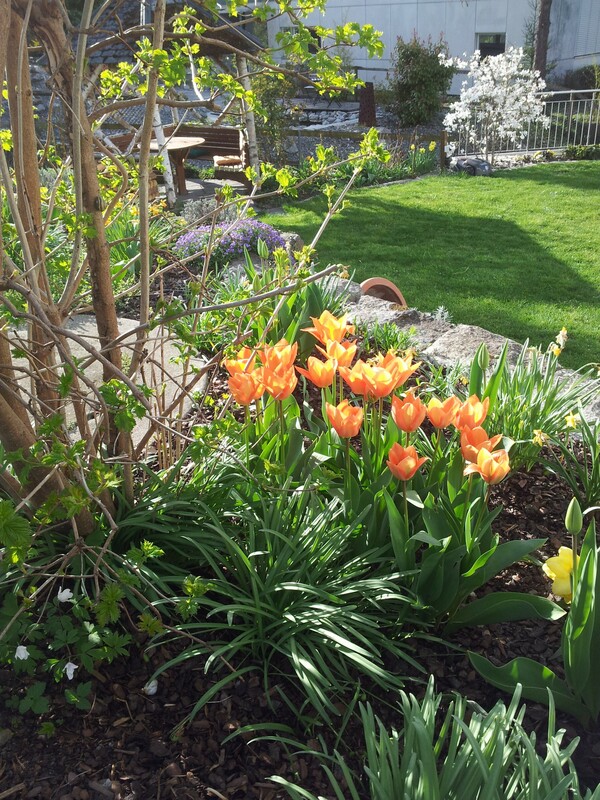 Come with me on a walk through my little village of Mörschwil, and be inspired. 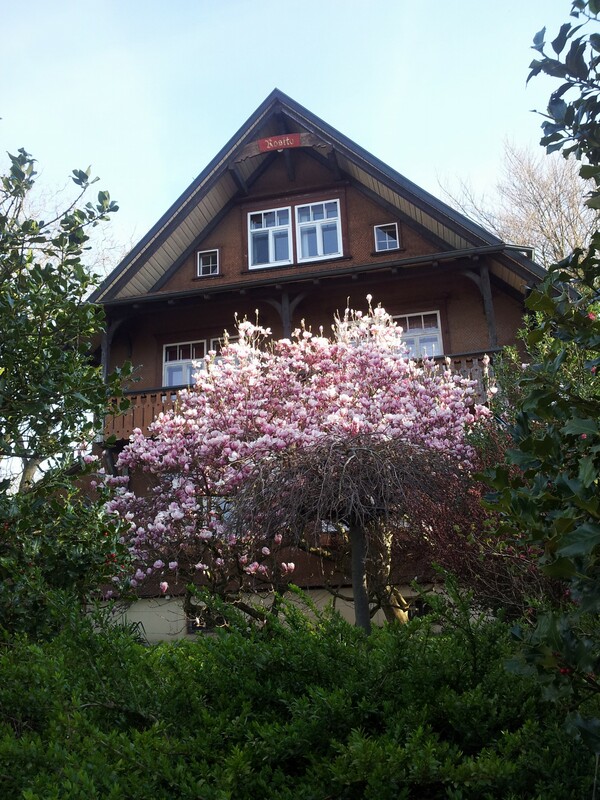 On Huebstrasse (street name) we have this old traditional house with a gorgeous pink magnolia tree in the front yard. Actually they are out all over the place, even in my neighborhood, by the woods. 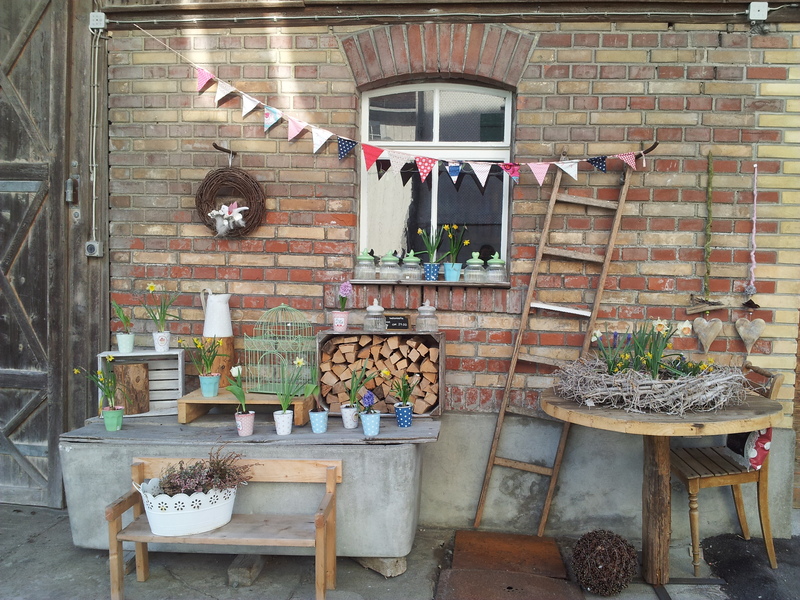 At a farm near the train station, there is this lovely little cooperative, in an old barn. They always have such nice displays. 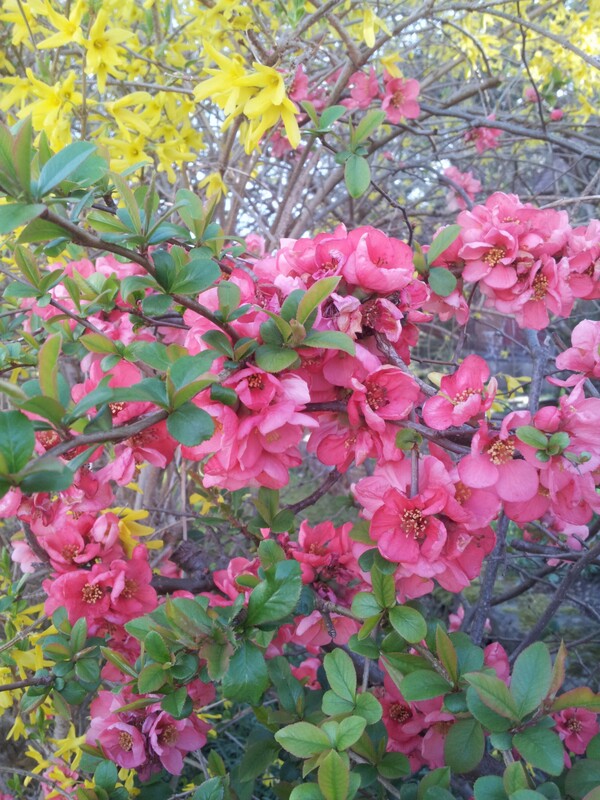 These coral blossoms are on one of my favorite bushes. I would really like to get one of these for my garden. From my house, you can walk down into the village in a maximum of 5 minutes, it takes you past this old house which just finished renovations this school year. I love how they renovated the old gazebo in the back, when the light is right I will get a better photo for you. Don’t you love those tulips? Well that is the end of the tour, I hope you enjoyed it! Oh Jodie, thank you – I did enjoy it! I too like walking first thing in the morning, although my walk is in suburbia and not nearly as pretty as yours, and for all the reasons you’ve said. Hi Meredithe, Well although my village has some areas that make it looks like it is in the middle of the countryside, Switzerland is tiny and so there are not much space between city and country except in the mountains!!!! We are only 10 min drive from our St. Gallen city and my house is walking distance to city limits. Of course I do not take pictures of all the yucky modern concrete blocks that are being built in this little tax haven!! So basically what I am saying is for me, I live in Suburbia, compared to Bermuda anyway. Australia I am sure has more defined areas? Nice hearing from you as always!!! Très beau votre village . Thanks Jodie ! Vielen Dank Elisabeth, ja es wird auf jedenfall mehr davon geben, nach eine Ausflug in herllichen Berneck, ein kleine Wein Städtchen in der nähe. Es ist. aber Österreich ist auch nicht so schlecht! Wir sind einfach kleiner und dass heisst, die schöne Sachen sind vielleicht näher zusammen!